Chanel’s creative director of make-up has joined Dior since last year hence it was interesting to see the looks they would come up with at their fashion parade in the glamorous Dubai. We caught a sneak peek as it would be interesting to see what new direction they take when it comes to make-up briefs and how we could incorporate elements of the looks for the wedding season to come. Exaggerated Lower Lashes. Now this is a look that can immediately start looking a little retro but if Chanel has it’s models sporting it on the runway, that means it’s back in the cool clan again. A great way to switch things up a little this wedding season. If you’re feeling brave, go all out and sport full on upper and lower lashes. They can be mascara clad or amplified with falsies as per your discretion. For a modern day wearable bridal make-up look, go easy on the upper lashes and leave them looking scanty and natural and turn up the oomph on the lower lashes. It also helps cover that pesky under eye concealer creasing! Two birds with on stone. A bit of gold leaf eye shadow is also dabbed on the models inner corners. 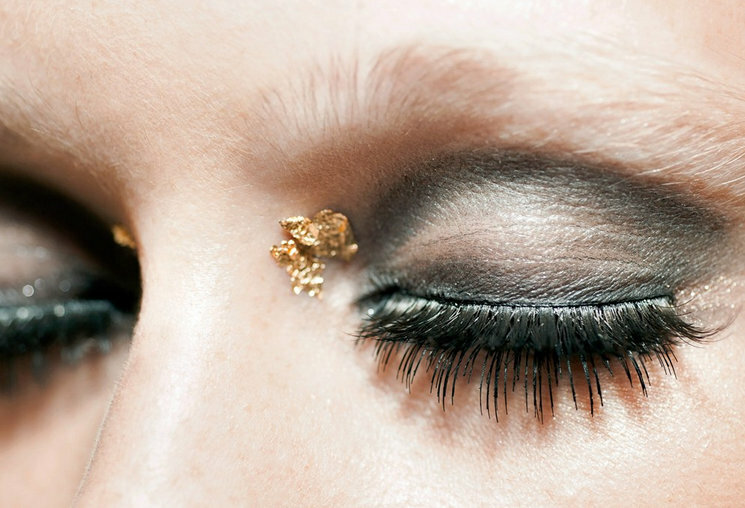 Although they have kept space between the eye make up and placing the chunk of 3d gold eye shadow, the golden goddess look can surely be adapted to bridal make-up. Perhaps not one for the bride herself, but if you’re bridesmaid or a guest at the wedding, it’s quite a refreshing twist from the muted neutrals. Keep eyes light, pale and glistening and dab a tiny bit of chunky gold, cream based eye shadow in the inner corners, lower lash line or centre of the lids, however you’re comfortable rocking it. Would look great with a tan and in the sunlight. The double edged graphic liner. Now this is not a new look at all and has been sported on the runway for quite a few seasons as it has a dramatic, fashionable flair to it like no other. However, it’s also a look that’s not been seen at wedding ceremonies very often. Although a tiny bit deviant, it surely can be sported in a soft, ethereal manner as shown by Chanel. Instead of creating the graphic liner look with eye liner, it’s been created using blendable eye shadows that created a seamless finish. Keep the middle space between the double edged graphic liner empty or fill it in with a white eye shadow or a shimmery silver for a radiant, Arabian princess like look.